Recent years have witnessed increasing scholarly interest in the North Sea World, allowing it to emerge as a northern counterpart to continental Europe and the Mediterranean, rather than being viewed as their poorer, more shadowy periphery. Admittedly, the North Sea World can seem both poor and shadowy compared to its southern neighbour regions when viewed through the lens of written sources only, but the region is rich in other kinds of evidence which, when gathered together, serve to demonstrate that the North Sea connected rather than divided the lands situated around it. The present volume is situated firmly within this research context, and aims to place Frisia and the Frisians at the heart of the North Sea World. The papers within the volume were originally presented at the conference 'Across the North Sea: North Sea Connections from AD 400 into the Viking Age', held at the Fries Museum in Leeuwarden. It is perhaps for this reason that some of them focus on the 'Neighbours' rather than the Frisians themselves. The short Introduction to the volume (1-4), though, places the Frisians front and centre by providing a brief overview of the current state of research into this most elusive of early medieval gentes. The remaining twelve papers address a variety of topics, specifically history, archaeology, historical linguistics, legal history, and runology. It is worth noting that, in contrast to many academic edited volumes with a wide scope, the papers are not arranged thematically or sub-divided into sections by topic. After two introductory chapters relating to Frisia and its place in the North Sea World, the articles are presented as a series of geographically and chronologically connected case studies. This was a conscious decision by the editors in order to emphasize the multidisciplinary nature both of the original conference and of the volume itself. For the general reader intending to read the book cover to cover, this works well, providing a nice variety rather than dwelling on any one topic for too long. For the purposes of this review, though, I shall examine the volume by topics rather than individual papers. The introductory chapters further consolidate the ease of use for the general reader by explaining in relatively accessible terms the key themes and topics of the volume. John Hines's article on the long-debated 'Anglo-Frisian question' (25-42) deserves an honourable mention for the clear and concise way the author examines and deconstructs previously held assumptions about the close linguistic, runological, archaeological and historical connections between the inhabitants of Frisia and the Anglo-Saxon kingdoms. Rather than dismissing the idea of Anglo-Frisian connections, Hines argues convincingly for seeing such connections in a more dynamic way than has been usual previously, emphasizing that connections changed in strength and nature over time. This idea of dynamic connections forms a thread which runs throughout the entire volume, providing a line of consistency of perspective not always present in edited volumes. Although several of the articles in the volume refer to Lex Frisionum in order to outline the geographical divisions within early medieval Frisia, there is only one article which focusses directly on the topic of legal history, that by Han Nijdam comparing injury tariffs in early Kentish and Frisian law codes (223-241). Even though the article sits nicely alongside the rest of the volume, it is hard to get a clear understanding of the wider world of North Sea legal history from this case study alone. The topics of history and archaeology are closely connected throughout the volume. In fact, the articles which address one also draw upon the other, reminding the reader that it is important to take historical context into account when examining archaeological finds and not to ignore archaeological evidence when reading historical sources. Thus, an introductory article by Egge Knol and Nelleke IJssennagger draws upon palaeogeography and archaeology in order to provide a narrative of the Frisian peoples from the earliest settlements in the Low Countries region to the end of the first millennium AD (5-24). Two further articles - by Menno Dijkstra and Jan de Koning, and Johan Nicolay - demonstrate how Dutch archaeological finds can shed light on the culture of the early medieval North Sea World (53-73 and 75-92). Arguably one of best articles in the whole volume is that by Tim Pestell on Frisia and East Anglia in the early medieval period (193-222). Connections between these regions have been underappreciated in the past due to a lack of explicit evidence, and subsequently have not been the subject of a detailed study. Yet Pestell draws on a range of literary and archaeological sources to demonstrate that connections of trade and politics must have been strong during this period even if they sometimes remain tantalizing out of sight. Arguments regarding linguistics and runology necessarily rely on even smaller pools of evidence than do those regarding archaeology and history. Nevertheless, the authors who attempt to tackle these topics in the volume are able to do much with little without straying too far into speculation. Not only do these contributions address the nature of spoken and written language in the North Sea World, they also examine the realities of communication across this world. The picture that emerges from these articles is of a set of initially diverse communities which, through an extended period of close contact resulting especially from trade networks, converged in terms of language and culture. This is demonstrated on relatively small scales - between Frisia and the Anglo-Saxon kingdoms (Gaby Waxenberger, How "English" is the Early Frisian Runic Corpus? The evidence of sounds and forms, 93-124) or across Saxony (Arjen Versloot and Elżbieta Adamczyk, The Geography and Dialects of Old Saxon: River-basin communication networks and the distributional patterns of North Sea Germanic features in Old Saxon, 125-148, and Iris Aufderhaar, Between Sievern and Gudendorf: Enclosed sites in the north-western Elbe-Weser triangle and their significance in respect of society, communication and migration during the Roman Iron Age and Migration period, 149-172) - and on larger scales - across the whole North Sea World (Pieterjan Deckers, Cultural Convergence in a Maritime Context: Language and culture as parallel phenomena in the early-medieval North Sea region, 173-192), and even into the Baltic (Christiane Zimmermann and Hauke Jöns, Cultural Contacts between the Western Baltic, the North Sea region and Scandinavia: Attributing runic finds to runic traditions and corpora of the Early Viking Age, 243-272). This wider perspective is welcome, but I felt that the two articles on Saxony were denser and somewhat less accessible to the non-specialist than other articles in the volume, perhaps suffering from a lack of the introduction that Frisia received. The scholarship on display in this volume is of the highest quality, but attention must also be given to the book itself, which is one of the most beautiful I have ever had the joy of holding. 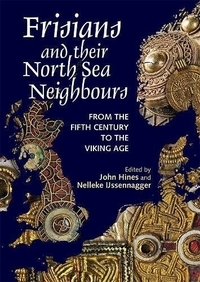 The cover illustration - a map of the North Sea World with the lands decorated in images of early medieval artefacts (from the Fries Museum) - encapsulates the core theme of connectivity while drawing the reader in, although the temptation to spend time admiring the cover instead is not easy to resist. The volume is illustrated throughout with both black and white and colour images of maps, artefacts, runes and more, as well as many tables. These serve not only to consolidate the authors' arguments, but to bring the North Sea World to life. Frisians and their North Sea Neighbours will obviously be a welcome publication for scholars of early medieval Frisia and the North Sea World. Yet even though the volume focusses exclusively on North West Europe, the articles provide coherent and convincing case studies of their chosen themes and so will also be of value to scholars working on these themes - and on issues relating to connectivity and networks - in other periods and geographical areas. I would like to congratulate the editors on putting together such an excellent volume.